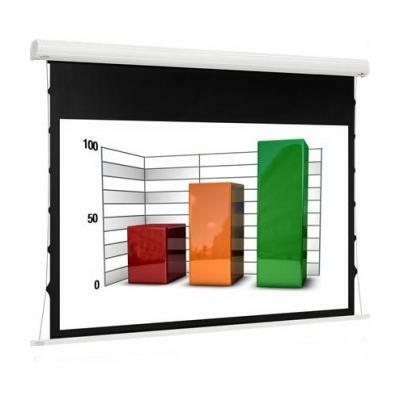 Euroscreen’s best-selling projection screen model is here equipped with a tensioning system. The channel-fixed installation feature makes it one of the market’s most flexible and easy screens to install. Thanks to its functional and comprehensive design the Diplomat is suitable for any application; especially popular in conference and education facilities, and home theatres. The tensioning function provides Diplomat with a flat viewing surface, and the surface flatness can be adjusted after time if needed. A new heavy weight bottom dowel in white finish provides extra vertical tensioning. The model is very popular in conference rooms where high technology Short Throw projectors are common and among home theatre enthusiasts where full HD projectors are used. Tab Tension function for long lasting flat screen surface. White cylindrical shaped aluminium case. Quick installation with the Plug n' Play feature. NEW! Heavy weight bottom dowel in white finish. Case size (W x H): 101 x 105 mm. Case length: screen width + 285 mm. Excellent choice in combination with Short Throw projectors. Quiet Motor available as option. Inline switch included as standard, other optional controls and accessories available.